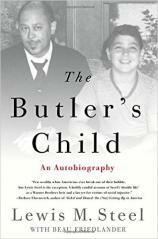 THE BUTLER’S CHILD is the personal story of a Warner Brothers family grandson who spent more than fifty years as a fighting, no holds barred civil rights lawyer. Lewis M. Steel explores why he, a privileged white man, devoted his life to seeking racial progress in often uncomprehending or hostile courts. In fact, after writing a feature for The New York Times Magazine entitled "Nine Men in Black Who Think White," Lewis was fired from the NAACP and the entire legal staff resigned in support of him. Lewis speaks about his family butler, an African American man named William Rutherford, who helped raise Lewis, and their deep but ultimately troubled relationship, as well as how Robert L. Carter, the NAACP's extraordinary general counsel, became Lewis' mentor, father figure and lifelong close friend. Lewis exposes the conflicts which arose from living and working in two very different worlds - that of the Warner Brothers family and that of a civil rights lawyer. He also explores his more than fifty year marriage that joined two very different Jewish and Irish American families. Lewis' work with the NAACP and in private practice created legal precedents still relevant today. THE BUTLER'S CHILD is also an insider's look into some of the most important civil rights cases from the turbulent 1960's to the present day by a man still working to advance the civil rights which should be available to all.